Written by Mike C. Fletcher on Aug. 16, 2005 in Design Theory. Last update on Aug. 16, 2005 . Went for coffee with Dan yesterday. Afraid I monopolised the conversation somewhat (I really do try not to do that). Mostly because I was thinking about thesis stuff, so kept blathering on about it. It was one of those situations where I realised just how out of practice I've gotten with explaining design and design theory. 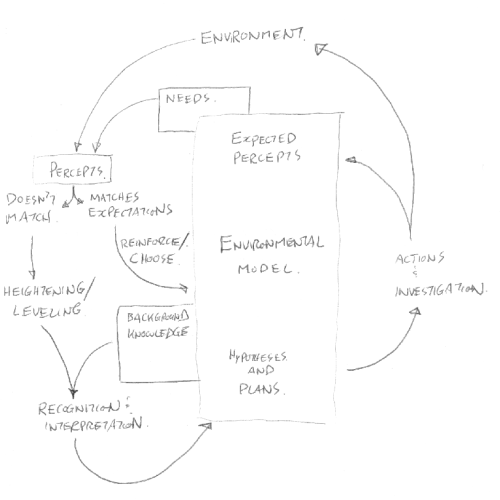 While I was there I sketched out a quicky diagram of the perceptual process. Problem is, of course, the perceptual process is so much more complex you just never get done the diagram and it gets unreadable pretty soon. Hmm, looking at the diagram again, it's missing an arrow from expected percepts to percepts, which is one of the key ideas: our expectation of what we will encounter perceptually plays a huge role in what we pick out of our environment and on which we focus our attention. When a perceptual field matches our expectations, we don't spend time recognising or interpreting it, we are constantly looking for the thing that doesn't match our model. When experience does match our expectations, our need to understand our environment is assuaged. Anyway, have to get up for a management meeting in the morning, so I suppose I should leave off and get some sleep.